The engine of the citroën saxo used in our exaple is : petrol 1.6 16V 120 hp engine. The image opposite (Fig. 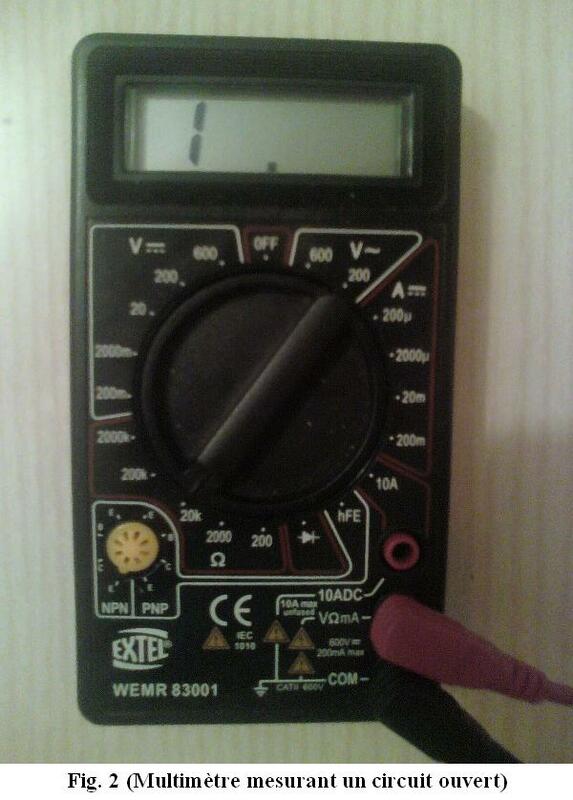 1) shows a diagnosis done on a Citroen Saxo 1.6 16v. Although there is no fault indicator lit on the dashboard, a reading done using our EOBD-Facile software reveals a problem. The ECU is showing a P0110 fault code, indicating a malfunction in the air temperature sensor circuit. A glance in the car's technical manual gives more information about this sensor. Like most temperature sensors, this one works on the principle of NTC (Negative Temperature Coefficient), the electrical resistance in the sensor changes according to the temperature it is at. The technical manual will also indicate the location of this sensor in the engine compartment. With this data, the sensor would seem to be at fault. 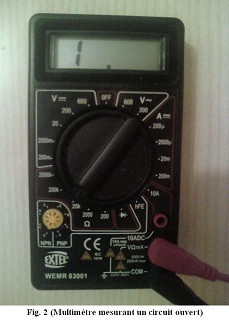 Using a multimeter set to ohmmeter (Fig. 2), measuring the resistance at the sensor terminals shows a "1" on the left of the screen meaning the circuit is open caused by a sensor malfunction. After replacing the air sensor, the fault code can be cleared using the clear button. The engine will now operate more optimally knowing the real air intake temperature. To confirm that the repair was successful, redo an OBD reading after doing a drive cycle. One question remains: why did the malfunction of this sensor not appear on the dashboard? Not all faults are considered critical enough to lead to an alert for the driver. For the air temperature sensor, the injection ECU will use a default value or an estimate that will replace the real value no longer available.